When you looking for a training facility you should look for a reputable company that has been in the training business for several years. This will show maturity and stability. We are specialists in dent training for years. 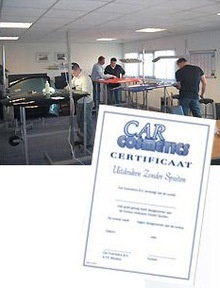 Car Cosmetics BV do not only train PDR but knows how to use it as well, and that’s very important. This will offer you the advantage of working with a company that wil have the answers to all your questions. Trainees start in the classroom learning the philosphy of dent removal, then get intensive hands-on training on practice panels. ( several Marks and colors). After students reach a level of proficiency in the training room they move to doing work on cars, with close supervision from instructors. We using the highest quality of tools with soft grips and will not rust. The tools have different shapes and sizes, also the tipsare different for use on different sized dents.